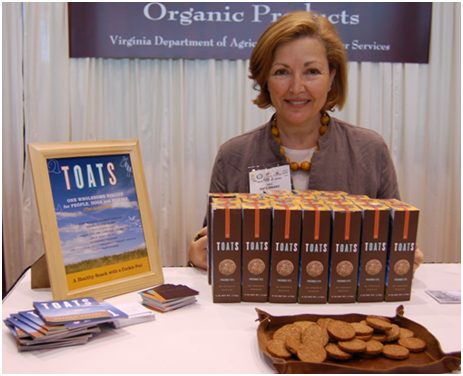 I came across “Toats” at the All Organic Expo in Chicago in 2009. I must admit I was quite skeptical of these “Friendly-O” things when I first saw them. They were little brown discs that looked like they might be the kind of thing you stick in the bottom of a flower pot to feed a plant. Not much to look at themselves but the package they come in is quite nice. And the woman behind the product was hands down the most passionate person I have spoken to in the entire organic foods industry. Even their Web site is certified “Green”. Marisol Fernandini-Gaffney created Toats (ToatsOrganic.com) to bring the world a healthy natural snack that you can feed to humans and horses and dogs or anything else that has a mouth. Rarely will I admit to eating much less enjoying something designed to be consumed by animals as well as humans but these things are addictive. She gave me five sample packs each containing two cookies and I just at the last one. I’m already jonesing for my next fix. It’s downright frustrating to be out of them so fast! The cookies do take a leap of faith. They do have the texture and odor of an animal snack. They are hard and grainy at first bite but by the time you swallow the first you are eyeballing the second. The next thing you know you’ve eaten ten, (beware, they are 290 calories!) The good news is that the entire experience was good for you, good for animals and good for the environment. I’m not exactly sure what Quilon is and what it has to do with parchment liners but she seemed pretty excited about it. It’s some kind of additive in the manufacturing process. I think it gives the cookies magical powers of some sort. Toats gets my votes for best-in-show at the Everything Organic Expo. These strange little cookies will most certainly find a home in my belly and on my shelf. The management philosophy is hard-core and the passion of the founder is rock-solid (as are the cookies). For a Zero-Waste lunch, you will still have to contend with the little plastic packs that contain two cookies each. The good news is that they don’t take up much space and are 98% biodegradeable. I’m not aware of any bulk packaging as of this writing, but I’m sure great things are in the pipeline. Congratulations on the new product, Marisol, I look forward to my next batch!